For me, our coop provides a community of diverse, but like minded artists. I enjoy being able to contribute to the community effort and at the same time feel supported by other members. habitats inspire my work. Aspects of Asian art, from the simplicity of bamboo stems and leaves to fine lines of lanterns and pagodas, can also be found in my ceramic pieces. 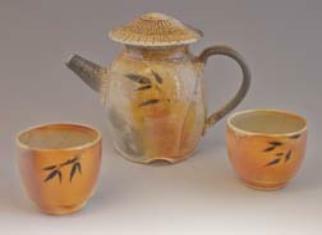 The glazing process I use includes traditional Celadon and Shino, the addition of salt or soda to the kiln's chamber, and the burning of wood to add elements of surprise.